The market is shifting towards lead-free alternatives, and we have listened to the feedback from our customers in the field. Important issues, such as the increased popularity of clad wheels on new vehicles, demonstrated that there is a need for a better alternative than steel or zinc. Plasteel® is a world first – a steel core wheel weight encased in a plastic outer shell. Engineered using forward thinking technology, Plasteel® is setting new standards for innovation in the industry. New appearance with curved profil, the redesigned Plasteel® looks like traditional wheel weights from all angles. 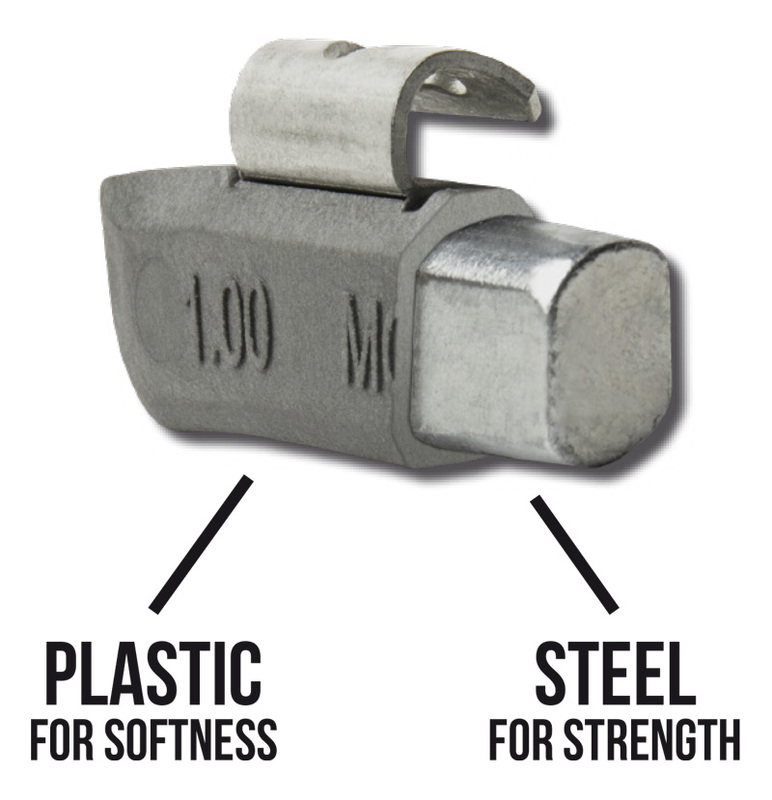 Plasteel® has an exceptional corrosion resistance. Underneath the rugged plastic shell, both the steel core and the clip are coated using OEM recommended coating for a protection surpassing stringent industry standards. In addition, the plastic overmold shields the coated steel core and provides protection against abrasion and corrosion. Plasteel’s metal coating and plastic shell offer double protection to corrosion which in turn yields exceptional resistance. Many OEM request 480 h of salt spray resistance and Plasteel® more than quadruples that amount with a resistance exceeding 2,000 h without trace of red rust (not even on the metal clip). Plasteel® is easy to install. In addition, this product series has no clip-only weights. Clip only ¼ oz are very frustrating to install and to remove because most standard tools don’t work well. The ¼ oz are easy to hold while installing, and removal is a snap. In the end they will save you time and money. A plastic shell acts as a buffer between the hard steel core and the softer aluminum wheel. This Hybrid-lock™ design is unique to Plasteel®. Plasteel® meets all requirements for OE car manufacturers, as well as international standards. Plasteel® has a tight and precise fit against the wheel. Unlike other steel wheel weight, there is not gap between the rim and the wheel weight. The wheel weight simply looks like it belong there! The body is formed from a solid piece of steel with a plastic shell molded around it. This allows the wheel weights to have a very consistent weight which increases you efficiency when balancing a wheel. Plasteel® is made of steel and plastic. Both of these products can be recycled easily without causing any damage to the environment. The United States Environmental Protection Agency (EPA) classifies steel as 100% environmentally responsive. Because the plastic shell acts as a buffer between the hard steel core and the softer aluminum wheel, the wheel weight goes on, and comes off the wheel with no damage. With raw steel and zinc wheel weights, the hardness of the metals combined with sharp edges often results in heavy and permanent scratches on the wheels. The softness and the malleability of the plastic shell make it go on the wheel very smoothly. Nearly used since a decade by tire professionals, Plasteel® stands out as much with major tire installers than tire shops. NEW Alumi-Flake™ finish with metallic material, the redesigned Plasteel® blends in with alloy wheels. They look like traditional wheel weights. For more information, please contact our customer service team at 1-800-611-7074 or info@plombco.com.